The Women Who Rock Project is building an interdisciplinary curriculum at University of Washington that not only examines cultural production and feminist activism from a scholarly perspective but also offers students the skills to generate multimedia forms of scholarship in critical, feminist decolonizing theoretical frameworks. This course introduces you to popular music studies through the practice of archive building, oral history analysis, critical writing and digital scholarship. In our readings and discussions, we will explore criticism that draws upon alternative archives to tell the story of popular music in innovative ways. We will ask how race/ethnicity, gender, sexuality, class and region fit into the stories we tell about particular genres of music. To grapple with this question, we will contextualize indie rock, hip hop and other popular music genres by considering the sonic and performance influences of a range of rhythms, tempos, and genres such as blues, gospel, estilo bravío, punk, son jarocho, and disco. We offer the course this year to coincide with the Women Who Rock (WWR) (Un)Conference—Making Scenes, Building Communities. We will engage with the WWR (Un)Conference and the WWR Oral History Archive to gain hands-on experience working with popular music studies as a field of practice. You will participate in the WWR (Un)Conference as digital scholars. As we analyze how various writers, filmmakers and musicians make sense of popular music by using particular histories and archives, we will use oral histories contained within the WWR Oral History Archive to create our own alternative stories in class. The WWR Oral History Archive features a diverse array of women from the U.S., Mexico and beyond, who have made significant contributions to music scenes, social justice movements, public scholarship, and community life. The course readings also draw heavily on work that has been shaped by the EMP Pop Conference, another Seattle-based popular music conference. You will use the course readings and the WWR Oral History Archive to produce scholarship in digital form at an introductory level in the form of blog entries, reviews and Wikipedia archive entries. In this way, you will not only come to understand the contours of popular music studies through its practitioners but you will also contribute to the shape of the field and its future. We treat this course as an experimental lab. The class examines the relationship between archives and storytelling in three ways: (1) through content that demonstrates the importance of storytelling in relation to popular music narratives; (2) through archive/meta-data methods; and (3) through individual and collaborative desktop media production. Instructor: Assistant Professor Martha Gonzalez, Scripps College. Spring 2015. This course introduces you to popular music studies through the practice of archive building, oral history analysis, and digital scholarship. In our readings and discussions, we will explore criticism that draws upon alternative archives to tell the story of popular music in innovative ways. We will ask how race/ethnicity, gender, class and region fit into the stories we tell about particular genres of music. To grapple with this question, we will contextualize indie rock and hip hop by tracing the sonic and performance influences of a range of rhythms, tempos, and genres such as blues, gospel, estilo bravío, punk, son jarocho, and disco. We offer the course this year to coincide with the EMP Pop Conference and the Women Who Rock (WWR) (Un)Conference—Making Scenes, Building Communities. We will engage with the EMP Pop Conference, the WWR (Un)Conference and the WWR Oral History Archive to gain hands-on experience working with popular music studies as a field of practice. The course readings represent work that has been shaped by the Pop Conference and published in previous Pop Conference anthologies and other single-authored books. You will participate in the WWR (Un)Conference as digital scholars. As we analyze how writers, filmmakers and musicians make sense of popular music by using particular histories and archives, we will also use oral histories contained within the WWR Oral History Archive to create alternative stories in class. The WWR Oral History Archive features a diverse array of women from the U.S., Mexico and beyond who have made significant contributions to music scenes, social justice movements, public scholarship, and community life. You will draw upon the Pop Conference, the WWR (Un)Conference and the WWR Oral History Archive to produce scholarship in digital form at an introductory level by creating photo essays and Wikipedia entries. In this way, you will not only come to understand the contours of popular music studies through its practitioners but you will also contribute to the shape of the field and its future. We will utilize this course as an experimental lab. There are three layers to the class that examine the relationship between archives and storytelling: (1) introduction to content—the importance of storytelling in relation to pop music narratives (2) introduction to archive/meta-data methods (3) introduction to desktop media production—both individual and collaborative. Rationale: scholars in the humanities and social sciences often cite evidence housed in archives to create convincing stories or narratives. But not all evidence is archived. This is frequently the case with pop music criticism. The WWR archive was developed to record and preserve evidence that has often been left out of music archives, so that new stories might be told. As we have found, at times, you need to create an archive to tell a new story. EXAMINES THE INTELLECTUAL PROJECT OF POPULAR MUSIC STUDIES IN RELATION TO THE THEORY AND PRACTICE OF ARCHIVE BUILDING, ORAL HISTORY TRAINING, AND DIGITAL SCHOLARSHIP. “Rock the Archive: Popular Music Studies and Digital Scholarship,” works in conjunction with the Women Who Rock (WWR) Digital Oral History Archive to prepare graduate and undergraduate students to analyze oral histories of a racially and ethnically diverse array of women from the U.S., Mexico and beyond who have made significant contributions to music scenes, social justice movements, public scholarship, and community life. The course examines the intellectual project of popular music studies in relation to the theory and practice of archive building, oral history training, and digital scholarship. Students will engage with critical archive studies, learn about the archive as a contested epistemological site, and create photo essays. In this way students will mesh scholarly work with the production of scholarship in digital form at an introductory level. In particular, they will explore the lives of extraordinary women musicians through primary oral history data contained in the Women Who Rock (WWR) Digital Oral History Archive, an intergenerational experiment in collective and decolonialarchive-building. Students will participate in the 3rd annual Women Who Rock (WWR) “Making Scenes, Building Communities” (Un)Conference, the Digital Oral History Archive Launch and Symposium and Film Festival on March 8-9, 2013. They will also have the opportunity to prepare a panel discussion of their work for the 2013 EMP Pop Conference. This course will utilize a feminist studies framework to explore the politics of representation through the production of digital narratives and oral histories of women (of all genders) and their allies who are making social change, breaking rules, making scenes, building community and rocking all kinds of musics from Hip Hop to punk, salsa, son jaracho, and Afro-Peruvian. Part I of this two-part series is aligned with the Women Who Rock Research Project and is designed to prepare graduate and undergraduate students to film digital stories and oral histories with people who have made significant contributions toward cultural practice through music scenes, public scholarship, and social justice work. Part II of this two-part series is aligned with the Women Who Rock Research Project and facilitates workshops around editing digital stories and oral histories with people who have made significant contributions toward cultural practice through music scenes, public scholarship, and social justice work. 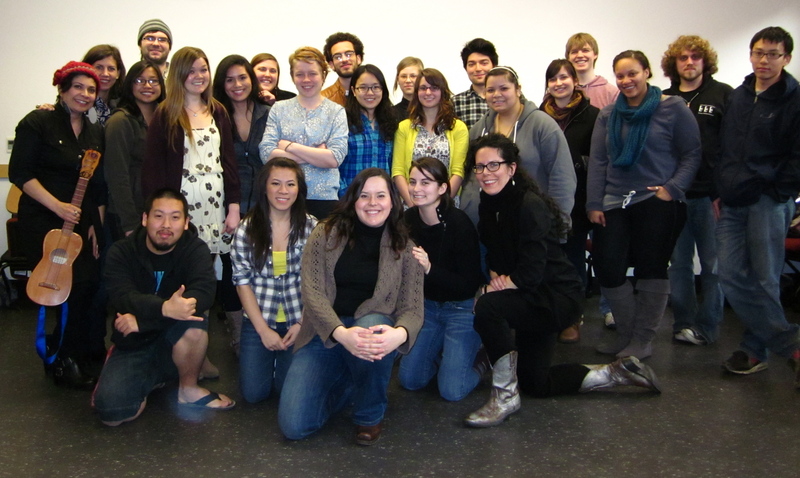 Students gain hands-on editing skills, learn about various post-production techniques, and work through ethical considerations of producing oral histories and short-form digital media genres. Our aim isn’t simply to review popular music criticism but to understand how particular narratives of popular music create the grounds for inclusion and exclusion that determine a band or scene’s “legendary” status or excision from the official annals of memory. Proceeding from this understanding, we will situate ourselves within this larger conversation in order to generate new narratives and new knowledge. Using the “Women Who Rock: Making Scenes, Building Community” (February 2011) as a case study and experiential site, the seminar will participate in the making of scenes and the building of community. In addition, we will document this community that the seminar is helping to nurture by building the initial phase of the “Women Who Rock” oral history archive of interviews with musicians, performers, and activists, in conjunction with the UW Libraries Digital Initiatives. As we listen to music, watch performances and read music journalism and scholarship, we will consider the pleasures and perils of music writing/documentation as a form of community building in our own praxis. Ultimately the readings and assignments help us to avoid traps of earlier critical writing as we respond to the question, what does it mean to make scenes and build communities centered around women who rock. The “Women Who Rock: Making Scenes, Building Communities” will be hosted at the UW and Seattle University on February 17 and 18, 2011 and the “Nirvana” exhibit opening at the EMP in April 2011.